Very nice. Compact, clear, elegant, keyboard-friendly, and expressive. Much more sensible to combine applications and project settings on one panel than to combine project settings and configuration. My only question is why the "Options" menu still exists at all. Surely "Path Macros" belongs on the Settings panel, and "Settings" only under the "File" menu. Settings panel, and "Settings" only under the "File" menu. menu. Options menu is going to disappear. Problem 1 seems to be intended behaviour, useful for people with 2 displays, I guess. help new users to find the clue. 3) GUI blooper: Settings is duplicated in the File and the Options menu. See my reply to Dave's message. Options menu is going to disappear. Nitpicking: I just think some of the dialogs are a little too tall and might look better if they were reworked to be wider instead. look better if they were reworked to be wider instead. Not being modal strikes me as a feature, not a bug. Ah, I see. That's good. I like the new concept. Cool. Next release of InspectionGadgets will move the "InspectionGadgets Error Highlighting" checkbox under the "Tools" menu, then, ideally right after "View Offline Inspection Results..."
Compact, clear, elegant, keyboard-friendly, and expressive. >> Compact, clear, elegant, keyboard-friendly, and expressive. >Very nice. Compact, clear, elegant, keyboard-friendly, and expressive. I couldn't disagree more : I HATE IT. All those icons in one panel, it's a pain in the eyes. I HATE IT. I'd agree to pay more for my license, if they remore this sore. I think it should be resizable, and also there is a small problem with the Project Settings->Compiler dialog. If you are in the dialog and hit ESC, nothing happens. It should cancel the dialog. >I think it should be resizable, and also there is a small problem with the Project Settings->Compiler dialog. >If you are in the dialog and hit ESC, nothing happens. It should cancel the dialog. It's not the size of the dialogs I hate the much, it's the new design. it used to be : start on row 1, and go down, till you find it. which you are not sure of the location. -click on the 1st icon, and read the panel on the right. >> Very nice. Compact, clear, elegant, keyboard-friendly, and expressive. JetBrains, Inc. / "Develop with pleasure!" Just try to locate particulad group of settings - it takes plenty of time. You need to look closely at every icon. Earlier you could just quickly click and see if the content on right pane is what you need. +1 I don't like it either. Bring back the old settings dialog with the icons on the left scroll panel. Use a tabbed panel or just a separator to divide the system settings and the project settings. I hope you are still planning on integrating the 'Configure Project' into the project settings..
-1000 in usability here to. The default project template dialog also feels a bit awkward and duplicated. Maybe that should be in the control panel, with the top level being general settings, then defaults, then project specific? The configure project panel should also be launchable via project properties, with a 'modules' button perhaps on the control panel. The UI feels like a poor man's OSX preferences page, without the user interaction behaviour. For example, with OSX prefs and the old approach, you could apply/dismiss a panel by hitting OK. Now you have to dismiss, then close the control panel. I dunno how easy it'd be, but something like the OSX one would be quite pleasant, with 'show all' at the top and some common shortcuts, and the main body pane would be the contents of a particular panel if selected, or the current control panel if not. > to easily find the one you are looking for. 1) It's harder to find the right option. 2) When you closed a dialog, you do not know, where you already were. I much more prefer the way OpenOffice arranges it's options. Alain, I completely agree with you. particular panel if selected, or the current control panel if not. are a lot of different sized dialogs which causes a lot of resizing. 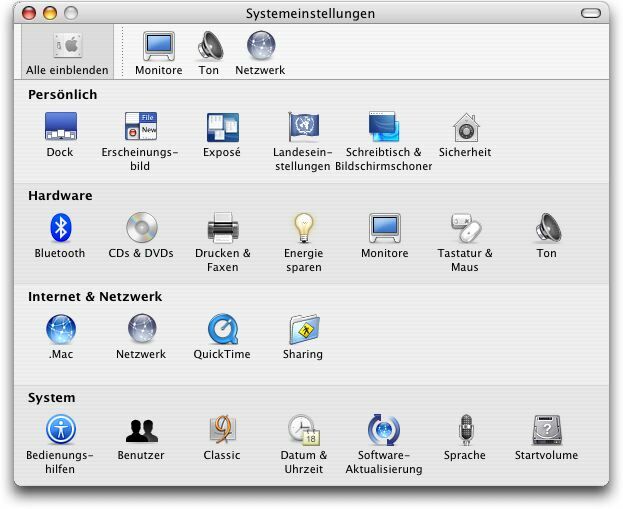 Just to give the non-OS X users an idea how that dialog looks like.